People often ask if taiji and qigong practice can help people to lose weight. The answer is yes, you can maintain an ideal weight—not too heavy, not too thin—if you can practice the following three principles from taiji and qigong practice. “Not too much, not too little, just right” is one of the key principles in Chinese philosophy guiding taiji and qigong practice. It is also the foremost principle in maintaining ideal weight. While everyone’s metabolism and ability is different, our weight directly correlates to our net calorie intake: total calorie intake minus calorie consumption. How much is “just right”? One famous Chinese grandmother saying tells us succinctly: 饭-fan吃-chi七-qi分-fen饱-bao, eat 70% of your capacity. Or you can go one step further by adopting another strategy: 少-shao吃-chi多-duo餐-can, smaller but more frequent meals/snacks. Due to the abundance and convenience of delicious food, it is so easy to overeat. Overweight people were rare when I grew up in China because there was not enough food. Now, China has more than 300 million overweight adults, according to a study at University of Washington in 2014. It is an unfortunate but avoidable peril that can come with economic growth. Applying this principle takes effort at the beginning but will get easier as you proceed. Research demonstrates that sufficient and quality sleep leads to healthy normal weight through enhanced metabolism and cognition. Will taiji and qigong practice help sleep? The answer is, not much if you practice only the taiji form and/or moving qigong drills. But the answer is, yes—and very effectively—if you include the stillness practice of standing, sitting, and lying down in your curriculum. A recent NIH-funded study demonstrates that our traditional taiji and qigong curriculum with standing and sitting meditation can significantly improve sleep quality and decrease anxiety, which in turn helps maintain ideal weight. 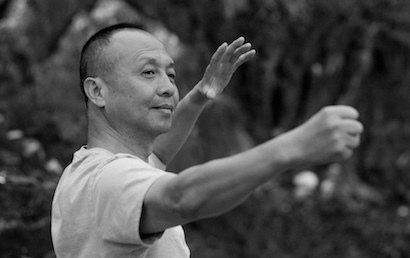 In traditional Chinese martial arts training, practitioners incorporate certain kinds of exercises to improve their agility, strength, balance, and cardiovascular fitness. I call this kind of exercise “agility training.” It can be categorized as cardio exercise from a Western exercise perspective. This type of exercise is even more important in modern life, given the combination of life style, convenience of transportation, and tight schedule. In older times, most taiji practitioners were farmers. They did a lot of cardio work in their daytime jobs. Doing slow taiji movements before or after their farm work was a complementary practice to build their martial arts skills. When I was training in China, I wasn’t a farmer, but sometimes I had to bicycle an hour one way to get to the park where I practiced. Now, most of us spend most of our time sitting, and even worse, we drive everywhere and walk very little. Doing taiji and qigong forms alone will not help us lose weight at all. We need to include one or a few cardio exercises in our daily or weekly exercise regime, for example, agility excise, biking, brisk walking, or jogging. Because most of my students have busy schedules, I now intersperse short agility exercises with traditional taiji and qigong form practice in our classes. In short, applying the moderation principle in eating, enhancing sleep quality by including stillness practice, and incorporating agility or some other cardio exercise into our curriculum can lead to an ideal weight for our health. I trust you will very likely see some significant results in a few months after adopting these three key elements in your exercise regime. And the good news is that you may not need more than 15 minutes of daily practice to see this result. I often write short training tips on my Facebook page, including about weight control. Stay tuned.